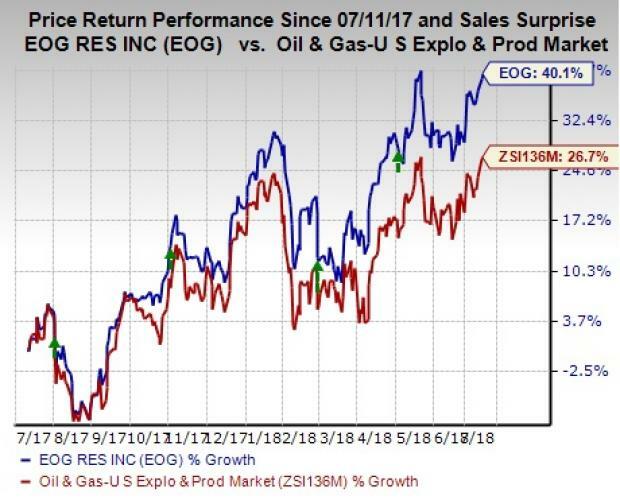 On Jul 7, EOG Resources, Inc. EOG has been upgraded to a Zacks Rank #1 (Strong Buy), implying that the stock will significantly outperform the broader U.S. equity market over the next one to three months. In a year’s time, the stock has rallied 40.1%, outperforming 26.7% collective increase of the stocks belonging to the industry. Over the past 30 days, the Zacks Consensus Estimate for 2018 earnings per share has been revised upward from $4.99 to $5.18. The Zacks Consensus Estimate for 2019 earnings rose to $6.36 from $6.19 over the same period. This adds to the company’s already impressive earnings profile. EOG Resources has surpassed the Zacks Consensus Estimate in three of the last four quarters, the average positive surprise being 30.1%. We expect the company to record earnings growth of 362.5% and 22.7% in 2018 and 2019, respectively. EOG Resources has a prime focus on the prolific domestic shale plays that includes Eagle Ford, Permian and Bakken. The shale resources have been driving the company’s production growth. In fact, for 2018, the company is expecting average daily production to lie between 685.8 and 728.5 thousand barrels of oil equivalent (MBoe/D), higher than 608.9 MBoe/D in 2017. The higher expected production seems lucrative, especially when the crude price is recovering. West Texas Intermediate (WTI) crude recently touched the $75-a-barrel psychological mark, showing more than 186% improvement from February 2016 when the commodity hit its lowest level of $26.21 since 2003. In other words, since EOG Resources’ production mix comprises of significant crude volume — 55.3% of total production during first-quarter 2018, the company is well placed to capitalize on the rally in oil price. Moreover, as compared with the industry, EOG Resources has significant lower exposure to debt. This is reflected in the company’s debt-to-capitalization ratio of 28.1% compared with the industry’s 46.2%. Other prospective players in the energy space include Continental Resources, Inc. CLR, Murphy Oil Corporation MUR and Marathon Oil Corporation MRO. All these stocks sport a Zacks Rank #1. You can see the complete list of today’s Zacks #1 Rank stocks here. Continental Resources beat the Zacks Consensus Estimate for earnings in the prior three quarters, the average positive surprise being 80.5%. Murphy Oil surpassed the Zacks Consensus Estimate for earnings in each of the last four quarters. We expect Marathon Oil to witness year-over-year earnings growth of 336.8% in 2018.